Walker, photographed by George Bernard Shaw. Many people have heard of William Morris. Those with an interest in fine printing or fine binding will know the names of St. John Hornby and T. J. Cobden-Sanderson. Few, however, remember the man who had more influence on the design of modern books than any of these great craftsmen: Sir Emery Walker (1851–1933). Walker was the son of a coachbuilder, and left school at 13 to support his family after his father went blind. He did not have the advantage of an Oxford education or of a comfortable middle-class upbringing. He was, however, smart and talented, with a keen sense of aesthetics. In the early 1870s, he found his calling when he went to work for Alfred Dawson, a printed who had perfected a new method of etching called glyptography. Walker worked for Dawson's Typographic Etching Company for 10 years, before leaving in 1883 to start his own firm of "process and general engravers, draughtsmen, map-constructors, and photographers of works of art." Walker's new office and house were in Hammersmith Terrace, a riverside neighborhood in London that was also home to William Morris. The two men discovered shared interest in socialism and craftsmanship which led to a lifelong friendship. Both were active in the Hammersmith Socialist Society and were founders of the influential Arts and Crafts Exhibition Society. 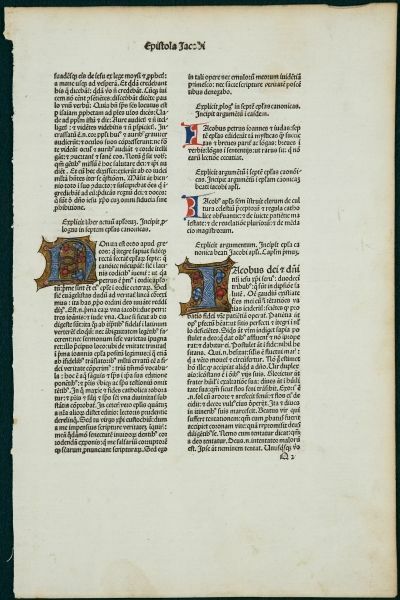 Walker was especially fond of the rare books known as incunabula, meaning they were printed before 1500. 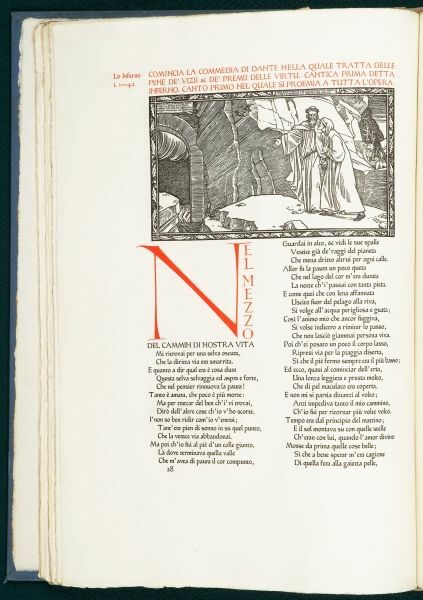 According to the Emery Walker Trust, "A lecture given by Walker in 1888 at which he projected magic-lantern slides of photographs he had taken of 15th-century typefaces gave Morris the idea for the last great project of his life, the Kelmscott Press." Walker declined to be a partner in the press, citing "'some sense of proportion' and no capital to risk." (DNB) However, he acted as an unofficial advisor to the press throughout Morris' life. In 1900, Walker joined with bookbinder T. J. Cobden-Sanderson to found the Doves Press as a vehicle for the production of the "Book Beautiful." 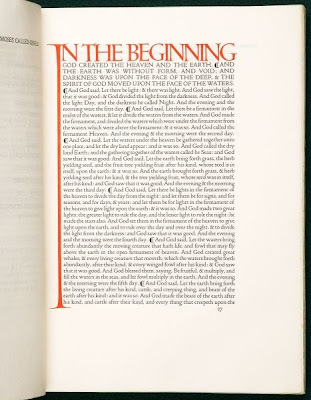 Unlike the productions of the Kelmscott or Ashendene presses, Doves books had no illustrations or decoration other than the occasional very simple hand-painted initial, as seen on the opening page of the Doves Bible, above. As Cave says, the Doves Press books, "completely without ornament or illustration, . . . depended for their beauty almost entirely on the clarity of the type, the excellence of the layout, and the perfection of the presswork." The Doves type, renowned for its beauty and readability, was designed by Walker, based on the typography of the 15th century Venetian printer Nicolas Jenson. 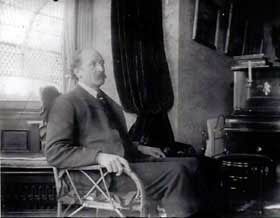 The eccentric Cobden-Sanderson was not the easiest person to get along with, and in 1909 a bitter disagreement between the two founders caused Walker to leave the press. Cobden-Sanderson carried on alone until 1916 when, after shutting down the press, he committed one of the greatest crimes in the history of typography: he threw all of Walker's gorgeous Doves type into the Thames, so it could never be used by anyone else (particularly Walker). Luckily, other examples of Walker's fine typograhics designs live on, notably in two fonts he designed for the Ashendene Press, the Subiaco (based on that of 15th century printers Sweynham and Pannartz, and the Ptolemy, based on 15th German type. 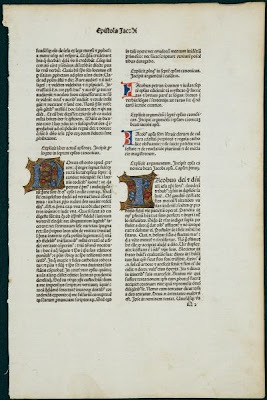 However, as the DNB notes, "his great reputation among students of typography rests on a far wider basis, for he was keenly preoccupied with the appearance of the everyday book, and not only with its rich relations. 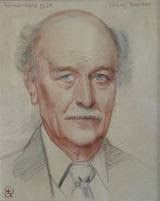 It is scarcely too much to say that his influence, direct or indirect, can be discerned in nearly every well-designed traditional typographical page that now appears, and that to him more than to any other man the twentieth century's great improvement in book production in Britain was due. Walker's exacting taste demanded close, even typesetting, perfect harmony between text and illustration, and excellent materials." The three ideal examples of modern typography are considered to be the Kelmscott Chaucer, the Doves Bible, and the Ashendene Dante. Walker inspired the first, printed the second, and designed the type for the third. He also went on to print an number of fine books at his own press, including a translation of Homer by Lawrence of Arabia. He was a modest man who did not trumpet his own achievements, and readers today who appreciate a well-designed page are unaware that they owe a debt to this genius of typography. Ah, should be "printer." Thanks for your keen eye.